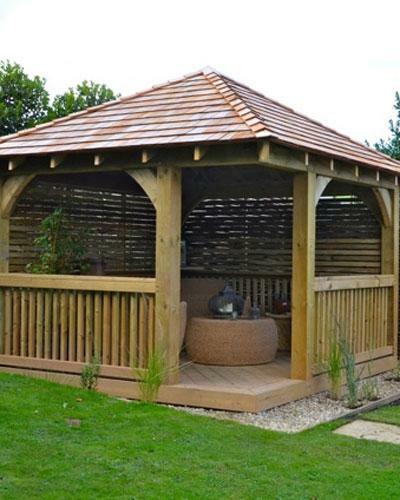 Throughout North Yorkshire we have been designing and installing bespoke garden Gazebos, using traditional carpentry skills for many years. The design brief given to use by the clients was to design and build an open sided gazebo in keeping in style and construction with an existing Oak Frame extension at the main house. We used pressure treated structural grade softwood where necessary and incorporated chunky 6 inch x 6 inch post and beam construction. True to the brief, we employed a mortice, tenon and dowel method throughout this scheme inline with the existing Oak extension. To provide added shelter and a modern twist, we fitted slatted screens to the two rear walls.